I walked over to talk to Nat Tour and Travels and had a long conversation yesterday with Nat, although I am learning this must be his nickname. As best I understand he is from the Netherlands also called Holland and is married to a Thai Woman. 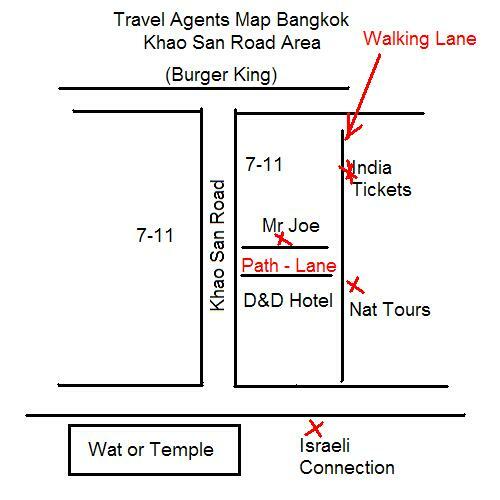 A Map of a Few Major Travel Agents in Khao San Road Area..
Khao San Road is about a three block street of mass people and people setting up business on the sidewalk. As normal in the world the sidewalks are for venders to sell and the road is a place to walk. Nonetheless, I had a long conversation with Nat, he is a good person, dry and to the point, not a lot of inflection in the conversation. Mostly right to the point on most conversations. I was joking with him try to explain that he has one of the worst client bases on the planet. A bunch of people who have too many tattoos, too many dreads, and probably are going to be on the dole most of their lives, trying there best to create an image that is unemployable in the world. He has a tough group to sell to, mostly trying to spend nothing and do not want to pay a fair price for anything. He sold me a set a ticket from the internet, if I would have known all the airlines I could have purchased on the internet and maybe saved more money. I personally do like travel agents and for sure I ask as many questions as possible when I find a good one. The trouble with a travel agent is normally they will give you a test price and if they think you are willing to buy on the spot, you do not get the best deal. You really do have to price out a ticket at about 5-10 places and then buy. Nat is an expert in a constructed set of locations. Like going from Bangkok to Jordan, Israel then to Egypt and off to England. He knows many cheap or low cost carrier paths. This is what is valuable with a travel agent. Finding the path of least cost on a city to city-to-city airplane trip. Most travel agents are not too smart, they only know one way, the type in the routes and tell you a price the computer creates. Nat or Mr. Joe or many agents in the Khao San Road area can create that funky list of cities and tell you or sell you ticket to all of the cities you wish to visit. LCC, I think is the term Nat used for airlines like airasia.com or in Europe it would be like Easyjet.com etc. These are the airlines off the list of publish fares or IATA list of airlines. They are the cheapies I am always trying to discover and log into my list of airline paths. Nat is fully aware and said something to the effect that in five years there will be no need to buy a plane ticket from a travel agent. I did learn the other day that by 2007 or something all airlines must use E-tickets. Then the need for a travel agent will be almost down to zero. However as I tried to explain to Nat to me a travel agent can save me hundreds of dollars in travel frustration. If I route out my path I will run into many obstacles that cost me money. I will stop in a city on the wrong day and not find a hotel and pay a lot. 5. Fly from the same city. A good travel agent will help you find all the small pitfalls along travel paths and help keep your life comfortable. Yes, there are thousands of agents that help you find and easy and simple route of flights from a city-to-city and hotel to hotel and after you are done, you will say or think the trip was very easy. However only about on in a hundred can tell you how to do the same trip on a Hobo budget. Nat and probably a few others on Khao San Road area can sell you a ticket for one-third the cost of the agent that sold you that comfortable trip. Bottom line you can normally travel anywhere on the planet, stop at a couple of places along the way for less than 700 Dollars USA. Any ticket that cost more than 700 Dollars one-way is starting to make me nervous. The around the world tickets do not work, they have too many problems. I would only buy one for a daughter to make sure she came back and did not marry the worthless men she sleeps with along the way, keeping her on the plane path so she does not fall in love with the “Ellos sin futures” those without a future. However other than that you can fly from place to place if you have the time and always buy the tickets along the way. My discussion with Nat was about my every present project to find a few strategic GATES on the planet where I can fly into, then take the discount airlines around the area and then make the big jump with full weight of my 37 Kilos or 80 pounds of backpack crap. 1. IATA Airlines in a database. 2. All LCC - Low Cost Airlines in a Database. 3. All the Airports on the planet. 4. The bases or routes they take. I think what I am trying to do, I will only know after I am done is to collect all the Airports of the planet or cities with the Airports. Then somehow tell all the Airlines and approximate cost to leave from this city to another city one level away. Nat is the kind of person that would know how to do this, there are books written about this type of information, and for sure, Johnnyjet.com my friend in the USA collects this type of data. My goal is to find these Nats all around the planet that can keep me on the cheaper path and keep me from making expensive mistakes. I can make the bionic man or woman of travel agents, a combination of travel agent and internet page… Fun. Travel Agents can work a lot with a person by email and never sell the ticket, most people are just plane rude, they will ask many questions and when a person tells them the same price, they do not go back to the person that spent time writing them emails. The essential problem is a travel agent needs to have a form that asks every question possible for the person to buy the ticket. Then they must negotiate the problem away, decide on a price, and then the agent must have the person pay with a credit card that makes it impossible for them to back out of the deal or contract. Most of this comes down to having some very good Credit card processing and an ironclad way of communication with the travel agent so that both parties can review the conversations and see what was said. An archive of all the emails in one spot that they can see, read, review and make sure or help them remember what they said. I am trying with techies to create this communication by online emails where a person has to give an agent enough information to help the person. The average travel agent cannot afford to make a page that is on the level of some discount airlines, this is bottom line. They need a site that would cost as much as a discount airlines site. My guess is the price for a normal discount airline is around 20,000 U.S. dollars minimum and is junk, until they do it the second time. I am sure many pay up to 100,000 dollars for a web site to process plane ticket and some I know they pay more. I am trying to figure out how to give this technology to a travel agent for free. I figure if I can help myself to buy tickets from Nat over the internet, I can help others. I never write a travel agent for prices. This is an almost worthless use of time. This means you probably could get on the internet and book all the flights as you went and never pay much for a ticket. Now if I can translate this abundance of knowledge into something possible to understand for anyone. I am amazed now how many people are being totally fleeced by internet pages. Mostly the big ones you hear about all the time, same as the travel agent that makes it easy for three times the cost of Nat. Any travel agent in a backpacker area will be cheaper than the ones hanging around near the Sheraton or Hiltons. This is where I collect information on Airplanes.